Actor John Travolta, a longtime aviation enthusiast and pilot, is donating his beloved Boeing 707 to the Historical Aircraft Restoration Society (HARS) in Australia. 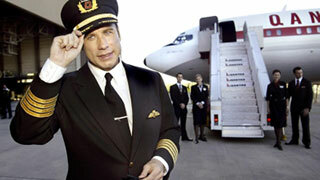 Travolta has a strong relationship with the country, having purchased his 707 from Qantas Airways when the airline retired the 1964-built jet in 1995. Travolta and wife Kelly Preston live in an exclusive Florida community where members own their own jets, land on a private runway and taxi right to their driveways. “The aircraft currently requires a lot of work to be restored to a safe flying state and having seen firsthand the dedication and passion of people at HARS, I have no doubt this beautiful and historical aircraft will be flying again,” Travolta said.